A Step Backwards, A Giant Step Forward. I am currently sat in Brooklyn Roasting Company on Saturday 11th March, actually feeling quite nervous to write again on NevNYC. And to be completely honest with you all, I am not quite sure why that is. I think out of all the BLOGMAS posts I had planned, this little three part series was one of the ones I was most excited to shoot and share with you guys! 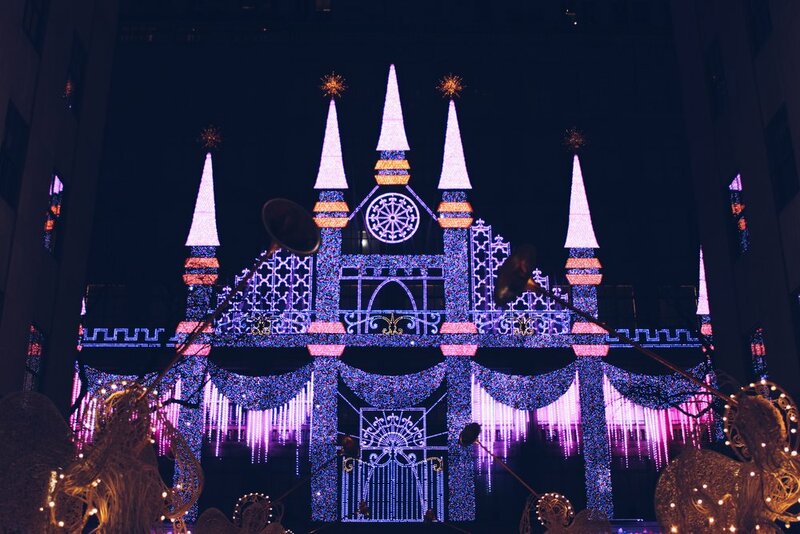 A huge part of my love for Christmas comes from the complete magic that is in the city during the festive season. Walking around the streets is like being on the set of Christmas movies like Home Alone 2: Lost in New York, Elf and of course Miracle on 34th Street! I thought that this year I would share with you guys some of the New York hotspots I highly recommend visiting during the festive season!! This time last year I was psychotically running around the streets of Manhattan with my faces pressed against the windows of department stores. You could find me under the Rockefeller Christmas Tree mesmerised by the twinkly lights or repeatedly wandering around the Bryant Park Christmas Market. 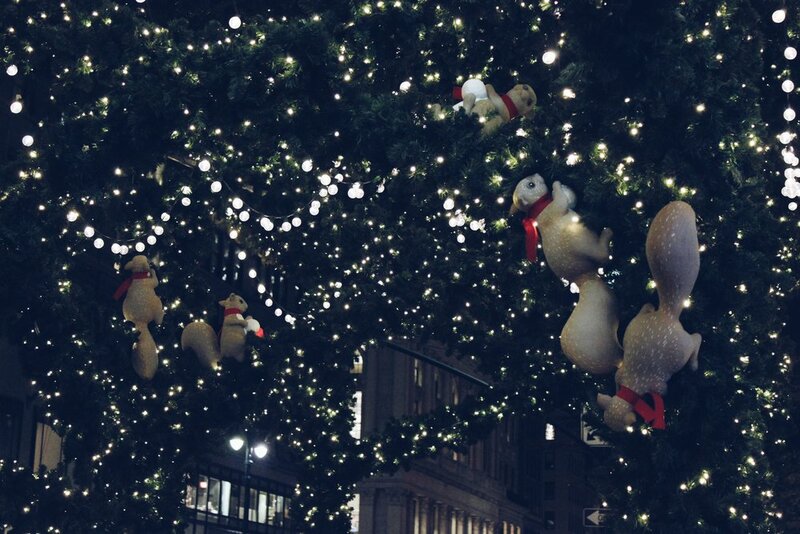 All things Christmassy here in New York just makes me even more thankful for being here! 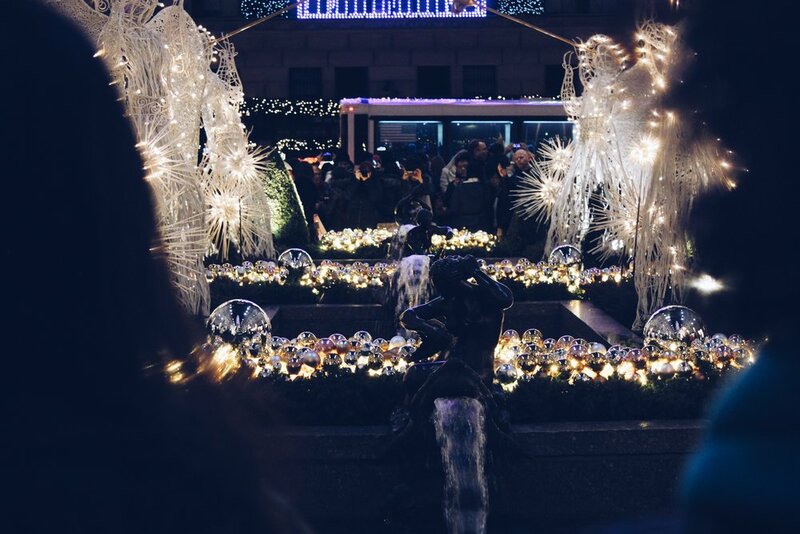 NevNYC has been the perfect platform to share my delight and thanks for having this insane opportunity so there was no way I could do BLOGMAS whilst here in NYC and not share with you guys some of the incredible sights there is to see!! 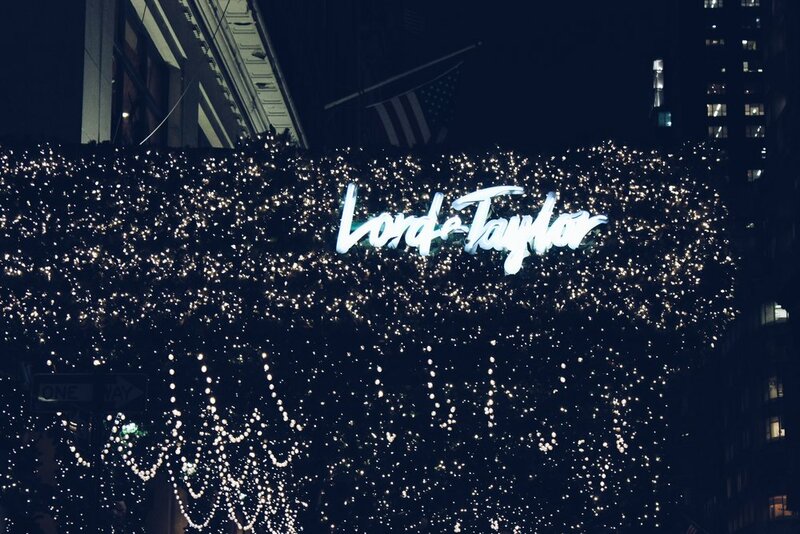 If you're in the Midtown area, swinging by Lord & Taylor to check out their windows is a MUST DO. I had never heard of the department store prior to last year as we don't have it in England, however when walking up 5th Avenue I was like a homing pigeon to the festive fairy lights that are wrapped around the awning outside, I mean it just makes for the perfect Christmassy picture! This year the theme for both the windows and the awning is "Enchanted Forest" and it is such a cute theme. Each window is animated and magical, I honestly could spend a solid hour looking in each window. I feel like one of those classic Christmas pictures of the children with their faces pressed against the windows. No seriously...that's me this year. The best thing for me about these windows is that they are not commercialised at all. 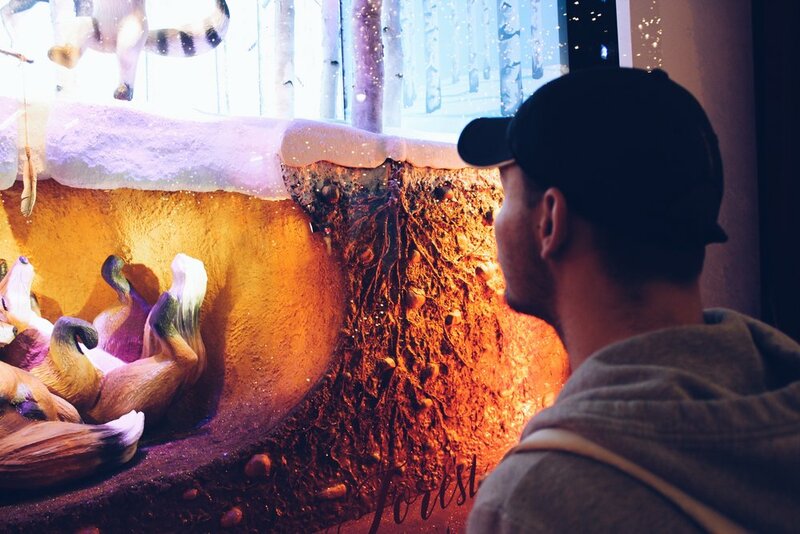 Usually and rightly so, department store windows are selling something through their festive decorations but here you can just immerse yourself in the magic and I really really enjoy that! Make sure you check it out!! If you fancy a little escape from the streets of New York then the Bryant Park Christmas Market is the perfect place to do so! Reminiscent of the famous German Christmas Markets, there are rows and rows of bespoke gift shops, food and drink as well as places to pick up a Christmas ornament or two! 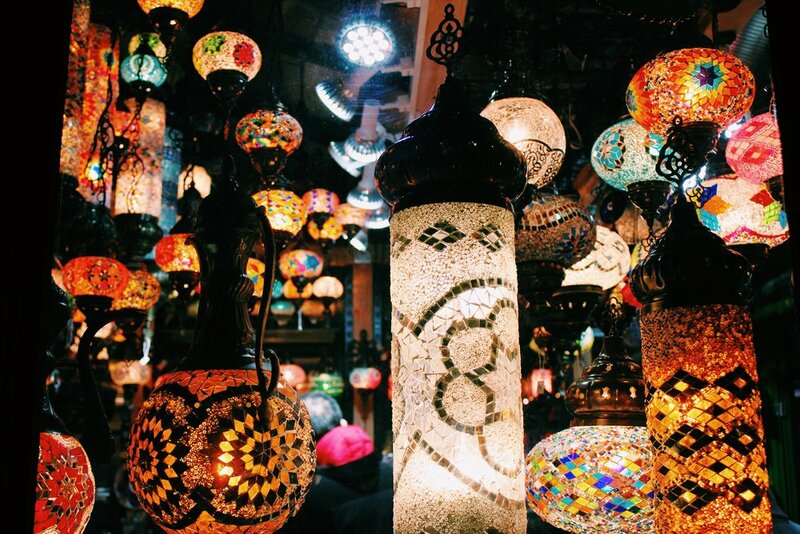 It is so refreshing to wander round the little stalls and just take in the festive buzz in the air! What makes it so special is that right in the centre of the market is a huge ice rink! Surrounding the ice is views of the New York Public Library and it just makes it all the more special. Gino and I grabbed a coffee and pastry and wandered around for an hour just looking in each of the stalls, I had to pull him away from making crazy purchases! If you're looking for something to do on a weekday evening then I can't recommend this place enough! Both the market and the ice rink get incredibly busy during weekends so be sure to plan accordingly when making your visit! If you wander up 5th Avenue you can't help but notice a huge glow in the distance, as you get closer and closer you will recognise that it is Sak's 5th Avenue. 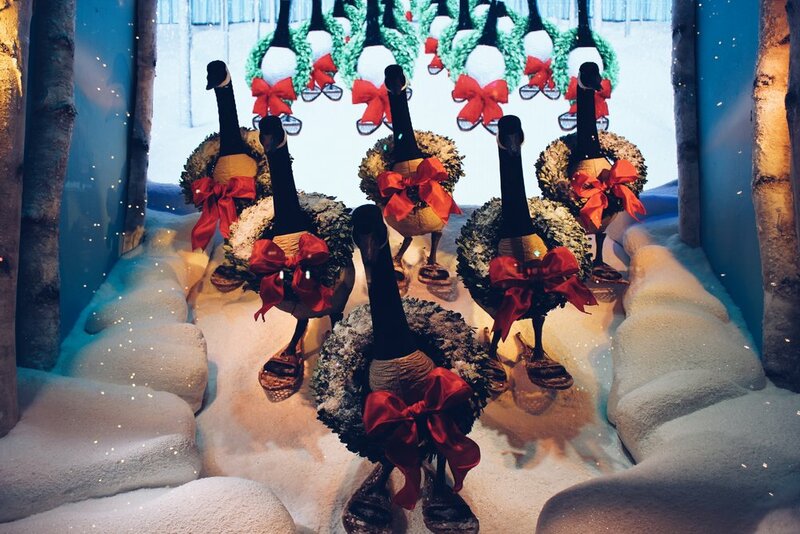 This department store to me looked like that classical Christmas window. Garlands and lights frame each window and as you walk along you notice the intricate detail they have entered this year. In the side windows is the fashion windows with various displays of designer gowns. However right at the very front is the main event. 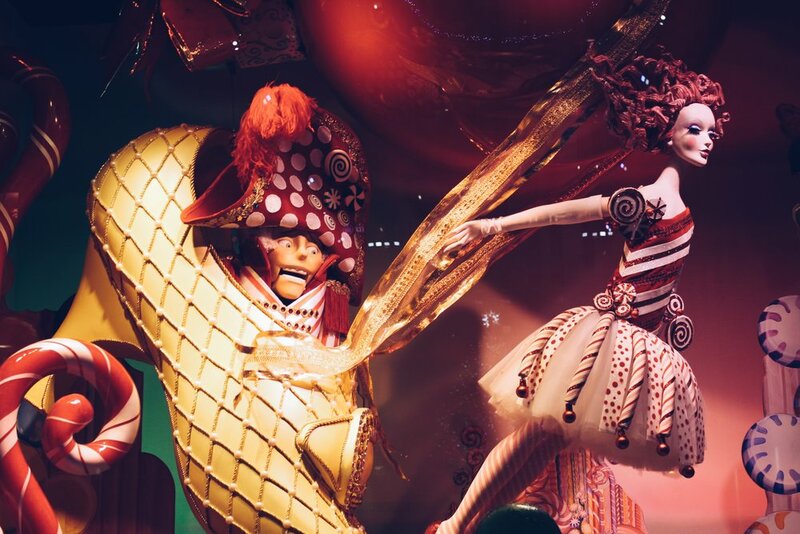 In the windows you have the story of "The Nutcracker Sweet" a tale in-keeping with this years theme "Year of 1000 Delights", the whole store is BRIGHT! 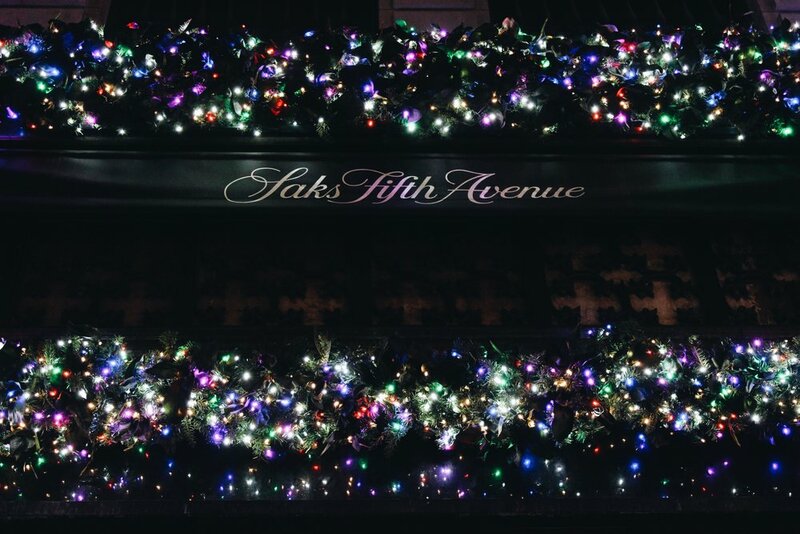 HOWEVER in recent years, Sak's Fifth Avenue has become renowned for is light show. And when I tell you that it is out of this world, I mean it! If you cross the street to the beginning of the Rockefeller Plaza (which I will be showing in Part 2) and face back towards Sak's, your breath is literally taken away. Every 10 minutes there is a huge light show played to "Carol of the Bells", the festive sound echo's down 5th Avenue and you cant help but be completely taken of by the Christmas Magic. I highly recommend heading to the spot I have photographed which is in-between the fountains down in Rockefeller Plaza. There is a much smaller crowd there than at the very edge of the sidewalk up on 5th Avenue. I will say this area gets EXTREMELY busy, so be prepared for huge crowds and try and time it so that you go maybe a little bit later in the evening as crowds tend to disperse around 10PM and the light show continues on until 11PM! I absolutely loved going on this little NYC Christmas Adventure with Gino, and I know he did too so I really hope you guys love this little mini-series too! I'm really looking forward to going out and shooting part two where I'm going to get photos and review even more iconic New York spots!